In 1741, the Catholic Franz Ferdinand Giuliani (1741) reported the first sightings of fossils in the Northern Dolomites, attributing these to the biblical Great Flood. Almost at the same time Giovanni Arduino (1714-1795), when studying the Dolomites of the Veneto Region, introduced the notion of dividing the earth’s history into eras from the Primary to the Quaternary periods. These early contributions made in the second half of the 18th Century led the way for the stratigraphic analysis. As reported in the literature of the 19th Century, mining operations concentrated scientific interest ever more closely on the Dolomites. At that time the entire area was under Austrian rule and this regime supported mining exploration and ordered the first topographic and geological maps to be drawn up. Interest was initially shown in the small concentrations of iron oxides within the carbonate rock of the Mid-Triassic period, which were often extracted from remote, relatively inaccessible places. Subsequently interest moved on to other minerals. Interest in the region was also gradually growing in academic circles. A most important contribution was made by a French nobleman and his discoveries. This was Dieudonné Sylvain Guy Tancrede Grater de Dolomieu (1750-1801), a scientist from the French region of Savoy and a distinguished Professor at the École des Mines in Paris. During a journey from the Tyrol to Italy in 1788, near Salorno in the Adige Valley, he took a sample of a carbonate rock that reacted in a most unusual way to acid solution. This observation aroused his curiosity and he sent a number of samples to the Swiss mineralogist Nicolas Theodore de Saussure, who analysed them and described them as carbonates of calcium and magnesium. This new mineral was called “Dolomite”, from which the Dolomites now take their name. Dolomieu made a further contribution to the scientific debate on the Dolomites in that, in 1789, he published a revolutionary, prophetic treatise on defining the age of intrusive and effusive volcanic rocks. Between 1790 and 1830, the Dolomites were playing an increasingly important role in the geological debate, considered an open-air laboratory for scientists involved in the controversy between the Neptunists and Plutonists, supporters of opposing theories about the origins of igneous rocks. The celebrated scientists Alexander Friedrich von Humboldt (1769-1859), Christian Leopold von Buch (1774-1853) and Louis Joseph Gay-Lussac (1778-1850), on their way home from a trip researching the volcanoes of Southern Italy, stopped at Predazzo to visit the Dolomite mid-Triassic magma deposit. Here they started making observations on the complex stratigraphic relationship between granite, an igneous rock, and the adjacent sedimentary fossil-rich carbonate rocks. Von Humboldt penned the first account of the geology of the Dolomites and made a careful study of the Predazzo intrusion. Christian Leopold von Buch formulated new theories on the formation of volcanic bodies. The discussions about the Predazzo magma field attracted a whole crowd of researchers to the area, transforming the little village inn La Nave d’Oro (The Golden Ship) into a lively meeting point for European geological theorists, as evidenced by the geological sketches left in the visitors’ book. The Italian Antonio Catullo (1782-1869) wrote the first essay on the palaeontology of the Dolomites and Venetian Alps in 1827, Saggio di Zoologia fossile, (Essay on fossil zoology). He also studied the region’s mineral deposits for the purposes of the mining operations of the Austrian Empire. Francesco Facchini (1788-1852), the first naturalist to have originated from the area (Moena), worked on dating some Dolomite basalt lavas, helping to define the tectonic set-up of the region. In 1814 Wilhelm Fuchs, geologist for the Agordo mines, drew some detailed geological maps of the northern section of the Dolomites. Graf Georg zu Munster (1776-1844) described the fauna of the argillaceous limestone of the San Cassiano Formation in his works of 1834 and 1841, thus drawing attention to the boundless paleontological riches concealed within these rocks. This work on the palaeontology of the region laid the groundwork for the modern stratigraphy of the Triassic Tethys Ocean. In 1860 the German geologist Ferdinand von Richthofen (1833-1905), at the tender age of 26, identified some complex Dolomite rock formations as of organic origin, tracing these bio-constructed islands and reefs back to ancient tropical marine environments and identifying the role of subsidence in the accumulation of some particularly thick layers of carbonate rock in shallow sea water. Another milestone in the Earth Sciences was marked by the publication, in 1879, of Die Dolomitriffe von Sudtirol und Venetien (1879), by Johan August Edmund von Mojsisovics (1839-1907), an illustrated volume containing some of the most spectacular photographs of the region and some highly accurate geological maps. He confirmed the precision of Von Richthofen’s observations and accurately charted the geometry of the deposits and the stratigraphic architecture of the fossil islands and reefs, findings that are still largely accepted today. Von Mojsisovics also made a major contribution to identifying and mapping a great many important tectonic lines. 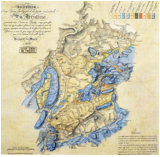 At the end of the 19th Century, the Austro-Hungarian regime produced a coordinated set of geological maps, with the aid of contributions from specialist palaeontologists, among them Guido Stache, Franz Hauer and Ernst Kittl. These maps set out the biostratigraphy of the Triassic era, whose stages were named after the ancient people of the Dolomites and neighbouring Alpine regions: Scythian, Anisian, Ladinian, Carnian, Norian and Rhaetian. In telling the story of the Earth Sciences in the Dolomites, mention must be made of the academic Maria Ogilvie Gordon (1864-1939). After obtaining a first degree in geology, her strong personality enabled her to become the first woman to be awarded a Doctor of Science. In the Dolomites, in 1893 and 1894, she studied the relationships between carbonate platforms, volcanic bodies and basins and, in 1903, the volcanic rocks of the Monzoni and Buffaure mountains. In the 1930s she was working on the Sasso Lungo-Sasso Piatto massif, scaling these peaks at the age of seventy. Later on in the 20th Century further studies were carried out by thousands of scientists from the world over, many of them very famous names. Today the Dolomites retain their importance as one of the areas of global geological and geomorphological interest. All the work that has gone into the Dolomites over the centuries has made it possible to chart a highly detailed and precise chronology for some periods in the Triassic era, and to document the recovery of life after some major upheavals. However, the process of dolomitization is still not completely understood and fierce debate still rages over that subject.